today i converted a INTEL NUC Kit DE3815TYKHE Atom processor E3815 (Thanks to Intel for providing the device) with the IGEL Universal Desktop OS 5.06.10x with the following results. From the performance point the device is ok and quite fast for a single core INTEL Atom CPU, it do not provide a high end multimedia performance for local Youtube and Movie playback but for typical office scenarios it’s ok for a device at this price point. The power consumption is very low end is round about 5w during regular use. 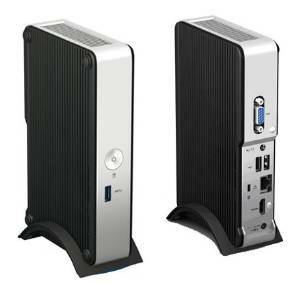 The case comes with a vesa mount and the device can be placed behind a display without any issues. there is a new IGEL UMS Version 4.09.110 available at www.myigel.biz. Fixed configuration of Citrix XenDesktop/XenApp sessions in a profile with Firmware LX 5.06.100. * The parameter “Authentication type” on page Sessions->Citrix XenDesktop/XenApp->Citrix StoreFront/WebInterface->Logon was not handled correctly. maybe you used already the Citrix Receiver Switch in IGEL Linux Firmwares before Version 5.06.10x. This old switch allowed you to switch between Citrix Receiver 12 and 13 and this was already really a unique feature. Since Version 5.06.10x you can switch between three Receiver Version, this allows you to choose the Receiver Version which works best for your requirements but you should note a few things. the recommended version for the particular firmware version (in this firmware it is Receiver 13.1.3). version does not contain the chosen version, the default version of this later firmware will be used instead. CAUTION: Please note that the default version up to this firmware was 12.1.8 for a long time now. continuing to use Receiver 12.1.8. This means, if you want to configure this thru the UMS the old Profiles will not work!!! You need to create a new profile for the new 5.06.10x firmware and than you are required to make the configuration thru System->Registry. Be warned, if you not perform this configuration in advance it can happen that the User is not able to connect to your Citrix environment. Tip: You can assign the old configuration (optimized for the Firmware < 5.06.100) and the new configuration at the same time thru the UMS. The firmware will choose the right setting by there own. maybe you noticed already that IGEL has now released two new releases for the OS and LX Firmwares. for support of the Lync 2010 Client (Lync 2010 and 2013 Server). for support of the Lync 2013 Client (Lync 2013 Server). This release integrates three Citrix Receiver versions: 12.1.8, 13.0.4 and 13.1.3. Only one of these versions can be active at a time. (in regard to the Citrix Receiver version). – Remote Applications are not seamless in the strict sense. These are rather displayed in an extra window decorated by the TC’s window manager. – If more applications defined and started in the same session, all are displayed inside this window. The default size of this window can be defined in the Window section of the Horizon session. – PCoIP user input language synchronization is currently broken. dragged to the screen edges. – At dual view configuration flash redirected windows can appear on wrong screen. resized to the correct size. – Windows XP sessions might not work properly anymore. – Only standard 105 keys PC keyboards are supported. Not supported anymore: Trimodal, Sun Type 6 or IBM 122 keys. – Mapping of drives to a dedicated drive letter is not possible anymore. – If Com-port redirection is enabled all linux serial ports (/dev/ttySx) will be mapped. – If printer mapping is enabled all printers configured in CUPS are mapped. – For Multimedia Redirection sound redirection with WMV/WMA streams is not working. – USB Redirection may not work reliable. (IGEL Setup->Sessions->RDP->RDP Global->Local Logon) is active. to authenticate with the configured session. – X-Sessions don’t work with UMD currently. – NCP Secure Client temporarely removed from firmware due to incompatibility with new Linux Kernel. – Updated Citrix HDX Realtime Media Engine to version 1.7.0-56. Citrix HDX RTME is used for Lync optimization. This version supports Microsoft Lync 2013 clients only. Registry Keys of parameters are listed there. – Updated Citrix HDX Realtime Media Engine to version 1.6.0-6. – Removed support for Softpro VirtualSerialSignpad. Please see next line for replacement mechanism. – Added support for Smartcard authentication at Citrix StoreFront. Citrix > Citrix StoreFront / Web Interface > Logon > Smartcard. Passthrough authentication with smart card is only possible with StoreFront version 2.x and above. for credentials and the login fails with an error message instead. – Removed parameter ica.wfclient.h264enabled. Please see next lines for details about the replacement mechanism. When moving a seamless window, the window might not be redrawn correctly in certain scenarios. Fix this issue by activating TWIRedrawAfterMove parameter. – On the user device activate TWICoordinateWinPosition and TWIRedrawAfterMove. – Added the parameters TWISetFocusBeforeRestore and ApplySucConnTimeoutToDesktops. Java applications, like jEdit, which were not redrawn correctly if the application was moved, or restored. between the desktop launches. (Default: Disabled). Windows Media Redirection. Since XenDesktop 7.1 server this feature is enabled by default. – Added the Toolbar to Workarea mode. This Feature is restricted to single monitor setup. – Better performance when RemoteFX is not used, but when compression is enabled. modifiying the registry key sessions.winconnectX.option.usemonitorfullscreen (X is the session number). – Added support for UPN Suffixes to IGEL RDP Client 2.
the user should not know the Gateway credentials, but should logon with his credentials in the Local Logon Window. in the Local Logon window. – You have to enter credentials everytime you start a Remote App. 9.2.0.6.20091224.1-_rc_-25848 still is available in the firmware and is active by default. – ThinLinc client updated to version 4.3.0-4538. – TIFF files are now openend directly in the document viewer. Only Navigation Bar and Application Menu remain changeable. If you leave these settings empty, the default set of buttons is used. Mind, that a button can only be used in either the Navigation Bar or the Application Menu. If it is included in both, the Navigation Bar will take precedence. The urlbar-container is always shown in the Navigation Bar. – The firefox profile partition is now formated as ext4 to avoid data loss. The particular partition has been enlarged to 50MB. needs to be set to 2000.
are deprecated in Firefox 31. – Added parameter to enable built-in ‘Do Not Track’ feature. – Added parameter to block redirection and autorefresh of websites. the authentication method will be shown in the tooltip of the WiFi tray icon. – Added driver for HID Global Omnikey smart card reader OMNIKEY 5021 CL (076B:5340) by new driver version 4.0.5.5. – Added support for automatic firmware update over all supported transfer protocols used by update mechanism. setup page System > Energy > Power Management. for battery mode it’s “system.power_management.cpu_gov_bat” with the default of “Balanced (recommended)”. – Added an tray icon to allow the user to change the CPU power plan. – Added support for Arabic Keyboard Layout. – Added MIME type handling to Browser. For more information visit http://edocs.igel.com/index.htm#10203086.htm. – Added image viewer to view images downloaded by Browser. – Changed english label of start button on Application Launcher’s Applications page from “Start” to “Execute”. A custom label for the button can be defined with parameter userinterface.launcher.displaynames.startbuttonname. – Added script hooks to run before a certain session is started and after the session has closed. This feature is only accessible through the System->Registry in the IGEL setup. can see the registry keys mentioned above. – Dynamic Client Drive Mapping added. USB storage devices manually by using the eject button in the task bar tray icon area to prevent data loss. (Devices -> Storage Devices -> USB Storage Hotplug -> Enable dynamic client drive mapping). StepOver TCP Client is different to the StepOver serversonet (padserver) functionality. * NOTE: Only one of these two can be used at a time. Select Touch Screen Type “Elo Singletouch (USB)” at setup page User Interface > Input > Touch Screen. Known-Issue: hold-to-right-click feature is not working. – Updated “Elographics (serial)” touchscreen driver to ELO Single Touch Serial touchscreen driver to v3.4.0. – Added possibilty to change display configuration on the fly via the “Display Switch” application. This will allow to modify the Touchpad configuration options. Note that the options listed below also requires hardware support from the touchpad. – Added support for Touchscreen monitor with DUS Series controller, for example EIZO T2381W. Multifinger gesture are supported, 2 finger for right-click, 3 finger for middle click. Known Issue: Scrolling with two fingers doesn’t work. – added possibility to change VNC port. Does not affect secure VNC. For more information visit http://edocs.igel.com/index.htm#10201440.htm. – Integrated VirtualBox Guest Additions 4.3.10 (OS only). – Ingrated Evidian AuthMgr version 1.2.5447. IMPORTANT: The first configured RDP session will be used. IMPORTANT: The first configured Horizon Client session will be used. – Added support for new product UD2-LX 40 based on hardware IGEL-D220. Decision to run applets or java webstart apps once the jvm becomes outdated is made persistent. – Fixed the non-printing issue when a USB printer is redirected to a session. will retry automatically after 5mins to print the job. – Improved handling of desktop icons with Citrix XenApp when “Follow server settings” is activated. This applies to connections to a Web Interface and to a StoreFront server in Legacy Mode. does not fetch the necessary information from the server). with Citrix Receiver 13. Before ctrl and alt remained “pressed” inside the window after switching. – Added parameter “Force NumLock On” (x.global.forcenumlock) in Registry to force NumLock state always on. This might be a workaround for problems with NumLock state. – It is now possible to use an IP address to access a Citrix server with Citrix Receiver 13.
host name if you want to connect via SSL. – The extended ICA application start mechanism is a central application launcher for Citrix sessions. while all other sessions have to wait till the currently starting session has established the connection. The max waiting time can be set via the setup parameter ica.pnlogin.app_start_max_delay. The default value for this parameter is 30 seconds. “Path to Store” entry field in the Citrix Store configuration in setup and UMS. – Fixed a bug that caused a crash during login sometimes. – Disabled session reliability by default as it causes problems under some circumstances. “Citrix > HDX / ICA Global > Options”. – Added detection for connection loss via TCP Keep-Alive packages to our Igel RDP Client 2. Now the session will not longer freeze if connection is lost. Instead the session will be terminated. – Fixed periodic mouse release if RemoteFX is enabled. – Added a message to inform the customer about SSL-Errors and Connection-Errors. Previously the session just dissapered without informing the customer. – Fixed disabling of the multimedia redirection in RDP sessions. – Fixed drawing issues for non-RemoteFX connections. – Fixed behaviour when using a RDP Session from smartcard and pull out the smartcard while the session is avctive. Now you won’t get bogus error messages anymore. – Fixed a bug which randomly aborted a file transfer to a mapped USB pendrive if the filesize was greater than 2GB. – Fixed potential client crash regarding offscreen pixmaps. a Session Broker, which is behind a TS Gateway by itself. support with TS Gateway, if the server behind the Gateway announces true multimonitor support. – Fixed bug for disabling features like RemoteFX or sound while using RD Web Access. – Fixed authentication problem with enterprise domain user names while using RD Web Access. – Close all active remote app connections on “RD Web Access Logout”. – Fixed problems with not working performance flag settings in RD Web Access sessions. – Fixed Horizon Client not closing when IGEL Smartcard is removed. – Fixed a focus problem of the thin client’s lock screen dialog in connection with PCOIP sessions. – Fixed COM port redirection: writing a large amount of data to serial port was failing for RDP. correctly and the values were not set. This e.g. affected 2X sessions. – Fixed bug: Running multiple 2X sessions in parallel did not work. – Fixed Thinlinc login window on suspend resume. – Fixed X Session not overlapping taskbar in fullscreen mode if taskbar position is top or left. monitor is set to “No configuration”. – Fixed the keyboard layout in Xephyr session login screen. The keyboard layout used is the current keyboard layout selected by the user. – Fixed managing of certificate with SCEP: expired certificates weren’t renewed automatically. – Fixed Genucard DHCP IP retrieval bug for newer Genucard versions. – Fixed detection of IGEL Smartcards in mode “Enable IGEL Smartcard without Locking Desktop”. Previously the insertion of any type of smartcard caused the PIN entry window to show up. removing the smart card did not trigger log off any more. and a bigger amount of sessions can be written to the smart card. – Fixed redirection of Cherry G87-1504 and Cherry ST-1503 eGK smart card readers via Citrix and RDP. – Solved the problem with the USB to TCP/IP port redirection in the new CUPS system. – Added timing to CUPS USB backend to avoid soft-reset to be sent during printing. – Security upgrade of libflac8 (CVE-2014-8962, CVE-2014-9028): arbitrary code execution via crafted .flac file. SSLv3 that exposes the POODLE attack. – Improved FAT USB Stick write performance with using flush,dirsync mount option instead of sync. To get back old behaviour switch devices.autofs.automount%.sync_option to enabled. – Show a message dialog and reboot device after an IGEL license has been successfuly assigned over UMS. – Fixed a crash of the disk utility when switching between entries in the left pane too quickly. – Improved behaviour of the lock screen / log-on screen in connection with notifications and prompts for network credentials. Fixed focus issues concerning the associated dialogs. (e.g misconfigured VPN or unplugged network cable). – Fixed a problem of the screensaver, that prevented it from loading images from a mounted Windows share. – Fixed a problem with IGEL soft keyboard and ICA/RDP session in full screen. – Fixed desktop panel freezes. – Fixed “Elographics (serial)” Touch Screen Type (setup page User Interface > Input > Touch Screen). – Fixed issue with resetted keyboard delay/rate options after reboot. – Fixed Custom Partition configuration while running a firmware update. – Fixed applying of rules based on USB Class ID. – Fixed Document/PDF Viewer not opening hyperlinks. (i.e. update from a USB stick). – Added hold-to-right-click function for “Elo Multitouch(USB)” and “TSharc (serial)” touchscreens type. Enable “Emulate right button” on setup page User Interface > Input > Touch Screen. at the same direction as the panel. – Window focus hotkeys now work even when no modifier keys are defined. – Fixed autostart of the sound control dialog. – Added hint in setup tooltips that suspend option isn’t available with Universal MultiDisplay. module: in some cases the dialog had to be accepted twice. is taken into account now.